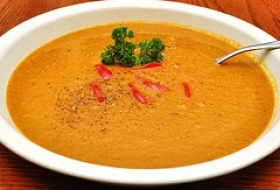 Have you made Carrot-Leek Soup with Thyme? 1. 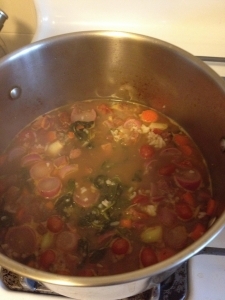 Make the stock and keep it warm over low heat. 2. Heat 1T of the olive oil and butter in a soup pot; add the carrots, 1/2 tsp. 3. salt and a pinch of pepper. Saute over medium heat until the carrots begin to glisten and release their juices, about 10 minutes. 4. A 1 c. stock, stirring and scraping the bottom of the pot to loosen the sugars. 5. 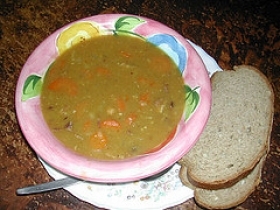 A 3 more cups of the stock and the potatoes; bring the soup to a gentle boil, reduce heat and simmer, covered, for about 30 minutes, until the carrots are very tender. 6. 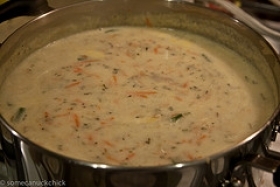 Add 2 more cups of stock and puree in a blender or food processor until smooth. 7. Return to the pot and cook over low heat. While the soup is cooking, cut leek in half lengthwise, wash and thinly slice. 8. Heat 1T olive oil in a saute pan and add the leeks, garlic, 1/2 tsp. 9. salt, dried thyme and a pinch of pepper. 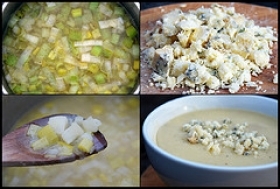 Cover and cook over medium heat until the leeks are tender, 5 to 7 minutes. 10. (The water on the washed leeks will help to wilt them). 11. 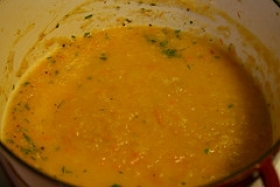 Add the leeks to the carrot puree and cook, uncovered, over low heat for another 30 minutes. 12. Add cream if you're using it and season with salt and a few pinches of pepper to taste. 13. Garnish each serving with Gruyere cheese and sprinkle with fresh thyme. 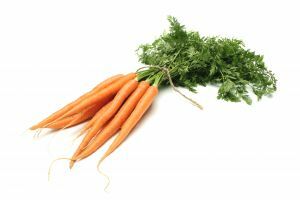 This recipe is high in Vitamin A with 538% of your daily recommended intake per serving. This recipe is high in Vitamin C with 28% of your daily recommended intake per serving. This recipe is high in Vitamin E with 21% of your daily recommended intake per serving. This recipe contains potential food allergens and will effect people with Butter, Potato, Garlic, Olive Oil allergies.